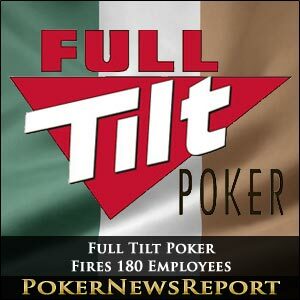 A Full Tilt Poker subsidiary with offices in Dublin, Ireland, laid off 180 employees last week, pounding yet another nail in the coffin of the shuttered poker site. In news that came as a surprise to no one, Pocket Kings, responsible for providing information technology, software, and customer support operations for Full Tilt, let go of 36% of its support staff of about 500 people in Dublin, according to the Irish Times. Management told employees in September that the lay-offs were coming and finally made it official after a consultation period of four weeks. The Alderney Gambling Control Commission revoked Full Tilt’s license in the latter part of September amid charges of bank fraud and money laundering that were filed against the world’s formerly second largest poker site in April. The U.S. Attorney’s office filed an amended civil complaint against Full Tilt and its board of directors Howard Lederer, Chris Ferguson and Rafael Furst last month, accusing the group of using $440 million in poker players’ funds to pay off its owners and board of directors. Pocket Kings Ltd and Pocket Kings Consulting Ltd, subsidiaries of Full Tilt, are also listed as defendants on the complaint filed in the U.S. District Court for the Southern District of New York. Full Tilt has also been served with a myriad of class action lawsuits from former players seeking relief in the form of returned funds that the company owes them. In a statement issued earlier this year, Full Tilt blamed the seizure of approximately $115 million by the U.S. government and cited the theft of funds by a third-party payment processor for its insolvency problems. In early October, Group Bernard Tapie conditionally offered to purchase Full Tilt, prompting speculation that it might reapply for operating licenses and retain some support staff positions in the Dublin office. However, sale negotiations have not been finalized. In February, two months prior to Black Friday, Full Tilt was flying high and had made an announcement intending to add 100 jobs to its Pocket Kings offices in Ireland. “This growth trend is estimated to continue at this strong rate for all of 2011 and beyond,” a Full Tilt spokesman said at the time. How quickly growth projections can change when greed and a lack of industry regulations converge. Pocket Kings employees who were let go from their support staff positions in Dublin were reportedly told by Full Tilt mangament that restructuring due to loss of revenues was the reason for the lay-offs. It’s time to put the poker mafia Ray Bitar, Howard Lederer, Chris Ferguson, and Rafe Furst behind bars. Take away all their property, their bank accounts, their homes, their families. They are despicable greedy punks.